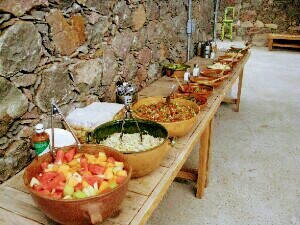 Sunday Pleasures in the Mexican Countryside -- Rancho Zandunga! This concept has blossomed into a weekly celebration, open to the public, welcoming locals, visitors, and friends. Sundays from 2 till 5 p.m. Zandunga offers great music with invited professional musicians (Gil is the musical director) and a tasty homemade dinner (Becca is the chef and supervises the well-trained staff) set in a rustic/modern ambiance that is spacious, friendly, clean, comfortable, and welcoming to all. On arrival, you are refreshed with a mint/lime frozen margarita — delightful! Recorded music sets the tone, musicians arrive to warm up, and the luscious smells of barbequed meat waft through the air. The cuisine invites you to sample the classic dishes and flavors of Mexico: blue corn tortillas, Oaxacan cheese quesadillas with a variety of fillings, Chipotle chicken, Oaxacan mole, roasted Poblano peppers, roasted pork “al Pastor,” mushrooms in garlic sauce, and a buffet of salsas, salads, and condiments ranging from mild to hot, all nicely presented and plentiful. Seating is casual, indoor/outdoor, with butterfly wing chairs, tables, wood benches, and the original “casita” that provides a living room ambiance. All is arranged around the performance stage and dance floor. Live music begins with soft classics (Sting’s “Fragile”), instrumental Mexican guitar, and compositions by Gil, who played at Carnegie Hall. As the afternoon progresses and the food digests, the music turns to jazzy, bluesy, funky, danceable tunes everyone can groove to. The dance floor is ample, freestyle is welcomed, ages 3 to 93! Friendly and open, the atmosphere at Zandunga is harmonious and fun-loving. The pleasures of life are celebrated here, nature surrounds it all, the staff is friendly and accommodating. What more could you ask for on a Sunday afternoon? 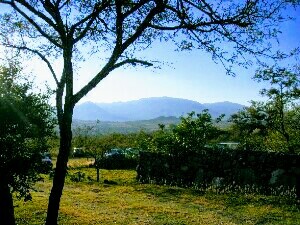 Rancho Zandunga is 20 to 25 minutes from central San Miguel by taxi, private driver, or car (known route, no worries). Prices are moderate and include full dinner, live music, and welcome cocktail. Cash bar.